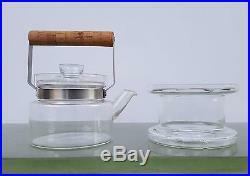 BODA NOVA GLASS TEAPOT & STAND PERSSON MELIN 1971 MID CENTURY SCANDINAVIAN. 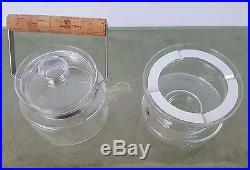 A very stylish Mid Century Modern heat resistant glass kettle/teapot and stand designed by Persson Melin for Boda Nova in 1971. 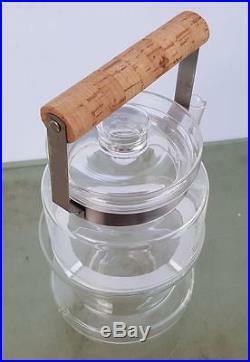 Smart design with stainless steel metal parts and a Cork handle. All glass pieces are in perfect condition and still have the Boda Nova Sweden labels, stainless steel parts are bright with no tarnishing, Cork handle clean and perfect. Collection from BH9 2PH if preferred. See my other auctions for more Art Deco Nouveau and Mid Century items. The item “BODA NOVA GLASS TEAPOT & STAND PERSSON MELIN 1971 MID CENTURY SCANDINAVIAN” is in sale since Thursday, January 21, 2016. 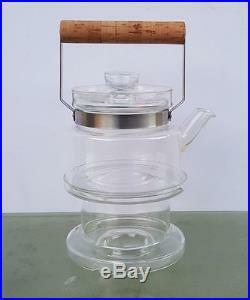 This item is in the category “Collectables\Kitchenalia\Teapots/ Kettles”. The seller is “sieclevingt” and is located in Bournemouth, Dorset. This item can be shipped worldwide.